Today I have a very fun and bright collection called as Pop Chalk Collection from Color Club to share with you which I got from HB Beauty Bar . This collection consists of 7 bright neon and pastel neon matte polishes among which one is white which is of course not neon in any way. LOL. The formula in these was pretty consistent, Application gets a bit tricky because few of them apply unevenly onto the nail. One of them even gave brushstrokes but not like the metallic polishes do. The drying time was a bit longer than I expected but once dry, these look super cool, my cousin was going gaga over these the whole day of swatching. All the swatches are shown without top coat to present the matte finish of the polishes. Colorclub Chalk it up - A one coater white matte polish, if you are looking for a one coater white, this one could be what you need with only one con that its MATTE. Shown here is 1 coat. Colorclub Extra Credit - A pastel yellow matte polish. Shown here is 3 coats. Colorclub School Yard Crush - A pastel peachy pink matte polish. Shown here is 3 coats. Colorclub Study Buddy - A neon coral matte polish. This one was super bright, as you can see in my pictures, it made my skin look so tan!! :D Shown here is 3 coats. 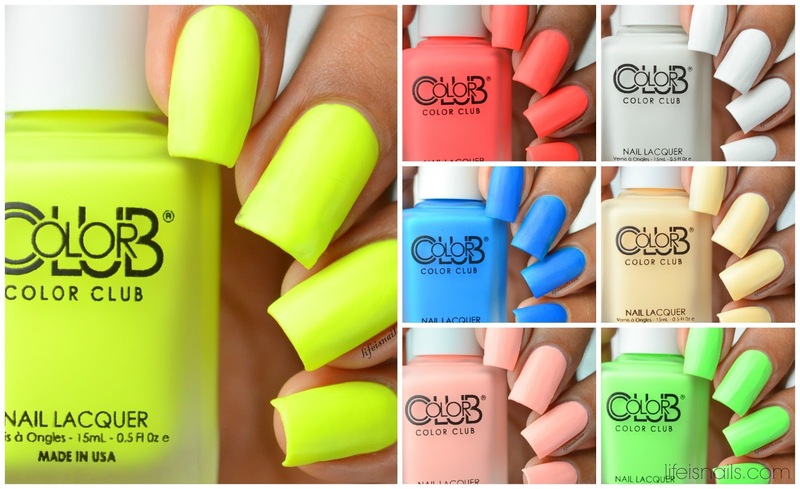 Colorclub School Cliff Notes - A bright yellow neon matte polish. Ah! This one is so so gorgeous. I loved it. It was a bit streaky though and needed at least 3 coats for the opacity. Shown here is 3 coats. Colorclub Tic Tac Toe - A bright green matte polish. This one give me lots of trouble while the application, gives brush strokes as well, I don't know if its formula is like that or just my bottle was a problem. But overall a beautiful color. Shown here is 3 coats. Colorclub Trapper Keeper - A blue matte polish. Its formula was the best according to me in this entire collection. You might be able to see my nail line in these pics but in real, it was pretty opaque. Shown here is 2 coats. Overall this entire collection is a good addition to your stash if you like neon matte polishes. These would rock your summer. With bright neons, the addition of pastel neons was a great idea by Color Club, and the White was like a cherry on top for me since I love one coater whites. They are always needed. Right Ladies!! You can get this entire collection along with the other stunning products at HB Beauty Bar Website. Shop for the most affordable polishes ever at HB Beauty Bar Online shop.